Marvel Studios: The First 10 Years Review – AiPT! A deep dive into the first 10 years of the MCU — though sadly, not as deep as some may want. Titan Magazines has come forth with a collector’s edition magazine chronicling Marvel Studios for its ten year anniversary. 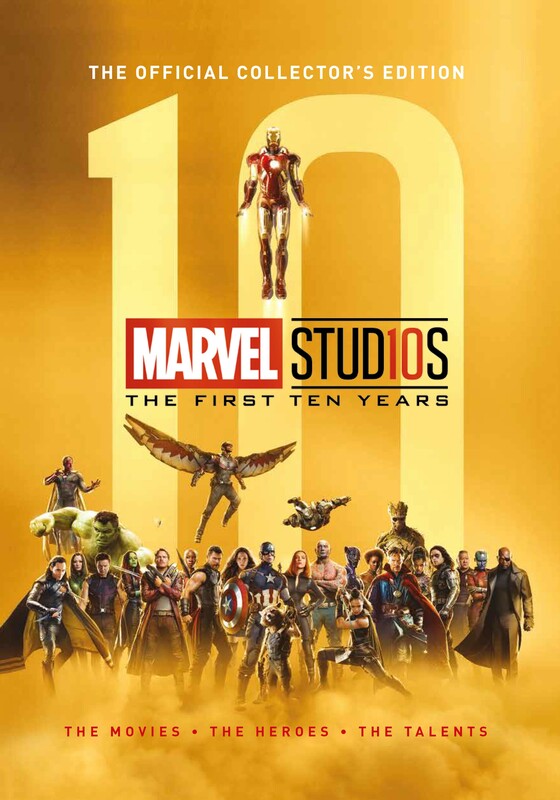 Comprising of behind the scenes photos, interviews, and an updated official timeline for the events of the films, Marvel Studios: The First 10 Years is a stylish volume. The majority of content of Marvel Studios: The First 10 Years is made up of interviews with major cast and crew members from the various films along with beautiful behind-the-scenes images. If you’ve been closely following the production of these films, there’s not much in the way of new information in the interviews, but it’s still nice to have all this information in a condensed form, rather than scattered about various volumes. The images are really well produced and crystal clear, giving you some fun behind-the-scenes looks at the films. The official timeline is fairly exciting and will probably be the main draw to any die-hard fan. I personally remember working with other fans across message boards trying to unscramble all the dates and retcons prior to The Avengers and while we did receive an official timeline with that film, this is the first real time we’ve gotten a timeline chronicling the events after it. There are some things that are nice to finally be confirmed (such as the fact that The Avengers and Iron Man 3 both take place in 2012), but there are also some new details that help our understanding of the films (such as dates for when Black Widow joined the Red Room program and when she later joined S.H.I.E.L.D.) as well as confirming just what period of time Doctor Strange covered. That being said, not everything is smooth. Black Panther is said to take place in 2017, with Captain America: Civil War taking place in 2016, which doesn’t line up with the events in the films, where Black Panther is clearly set around a week after Civil War ends. Perhaps one could say that Civil War takes place at the end of 2016, but that doesn’t really line up with the weather shown in either of the two films. And what of Spider-Man: Homecoming‘s “8 Years Later” gaffe? Well don’t sweat it, because there aren’t any answers here. In fact, Spider-Man: Homecoming is completely absent from this collection barring a reference to Captain America: Civil War‘s post-credits scene – a disappointing revelation that is likely due to licensing between Titan, Marvel, and Sony. The handful of pictures of Spider-Man in the volume are from his appearances in Captain America: Civil War and Avengers: Infinity War. It’s a frustrating absence, especially considering the all-encompassing nature of this collection. Constructed for the more mainstream consumer, Marvel Studios: The First 10 Years is a well-produced package from Titan Magazines. While it would have been nice to see more of a deep-dive into the minutia of the films and the process behind them, this is still a nice look, considering the number of films being explored. The absence of Spider-Man: Homecoming is a noticeable loss, but it doesn’t take away too much from the collection’s value. A nicely produced volume that will fit nicely into any fan's collection, Marvel Studios: The First 10 Years is a comfy edition that looks at the films of the red hot studio. However, the dive isn't quite as deep as many fans would prefer, and the absence of Spider-Man: Homecoming makes the volume feel incomplete. The interviews nicely capture cast and crew at various stages of Marvel's ten year run. The behind-the-scenes images are well produced and capture some great moments. The absence of Spider-Man: Homecoming isn't a huge loss, so much as it is a detriment to the "all-encompassing" feel of the collection. It's just weird not to have it. For die-hard fans, there isn't that much new information to be had here. Even the Easter eggs are things that are well-known.